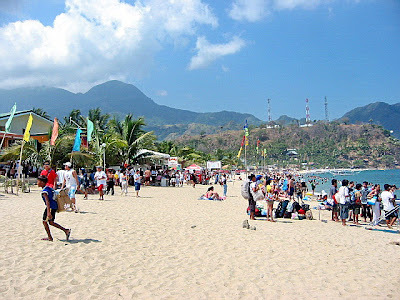 Of course, any visit to to Puerto Galera is never complete without trying out some of the town’s 13 superb beaches and a number of its offshore islands. Come morning of the last caravan day, after breakfast at Marivelles Restaurant at the top floor of Marco Vincent Dive Resort, we were driven to the town’s seaside tourism information office. Here, big outrigger boats were docked to take us to the small yet charming and beautiful Boquete Island (also called Paniquian Island), one of the islands that dot Muelle Bay. Technically, it is a peninsula as it is connected to the mainland by a 50 m. long, scenic white sand sandbar, but it does become an island during high tide. Elizabeth’s Hideaway Resort & Restaurant, formerly Sandbar Boquete Beach Club, is located nearby. Windsurfing is done off the sandbar which is perfect for speed trials as its sheltered waters are generally flat. Wind speeds here can reach 20 knots at times although, generally, the wind speeds are consistent during the daytime at between 10 and 15 knots.. 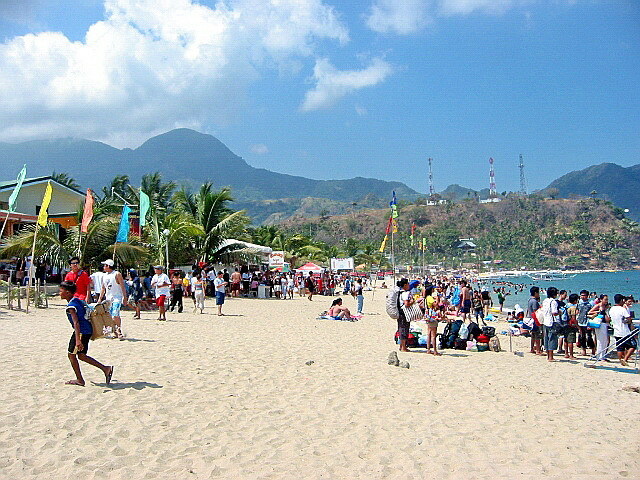 The sandbar is a regular venue for the second leg of the Philippine National Windsurfing Championship circuit. Ms. Susan E. Cruz (Tourism Operations Assistant) and Ms. Sienna May R. Manongsong, both of the Oriental Mindoro Provincial Tourism Office joined us. The boat trip took a little over 30 mins. and we made landfall at the white sand beach fronting the unfinished Friday Boquete Resort. Here, we were to have lunch at one of its picnic sheds. The beach is nice and secluded, with clear blue waters, and is away from the maddening crowd and the loud sounds of bars, restaurants and party places of White Beach. However, sea urchins are present a short distance from the shore. 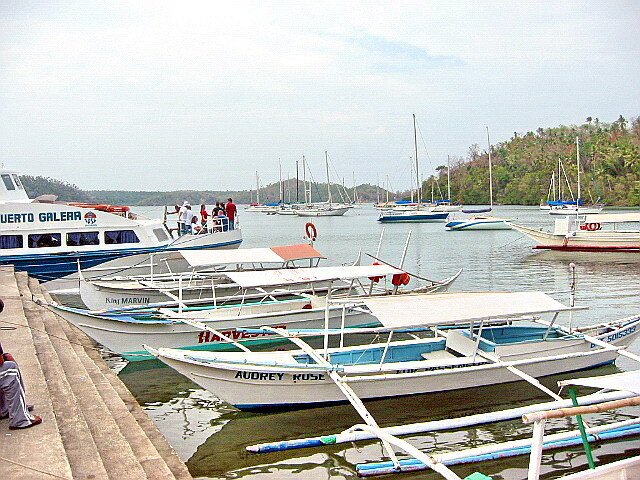 East of the island are the waters of Muelle Bay while to the west is Balatero Cove. This 3.8 hectare property, located on a powdery white & pink sand beach inside the lagoons of UNESCO-protected Muelle Bay, is a sister resort of the 5-star Friday’s Boracay Beach Resort in Aklan and both are owned by the publicly listed Boulevard Holdings, Inc. (BHI). When operational, it would have 62 luxurious native cottage styled rooms, a restaurant (that can be converted into an events are), beach grill, lobby lounge and bar, a huge outdoor ,free flow swimming pool and deck, art/shop boutique; dive training pool; full-scale dive shop, a spa treatment pavilion, and gymnasium. As lunch was still hours away, we still had time to do banana boating (PhP350/pax) or avail of a package tour to San Antonio Island consisting of a visit to an underwater cave and snorkeling the spots around the Coral Garden, looking for a meter long giant clam underneath —all for PhP300. Of those who availed of the banana boating, half opted for its milder form (no overturning) while Eva, Cel, Mike, Sheena, Gabby and yours truly went extreme and were rewarded with three dunkings, the last one when we were returning to shore. 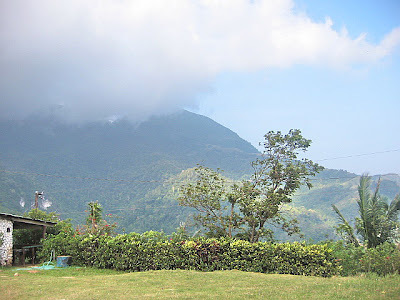 After lunch at Benilda ng Bancuro Resort & Restaurant, next on our Oriental Mindoro Cruise Drive Caravan tour was the Bancuro Church Ruins, more popularly known as Simbahan Bato (Stone Church), just a short drive from the resort. This old, roofless ruin is what remains of an Augustinian Recollect church and priory that was built in the 1690s, on swampy ground, with adobe and coral rock. The church also served as a fort and a place of refuge against Moro invaders. After several tries by marauding Moro pirates, the place was finally overran by them. The pirate were said to be looking for the church’s bell, said to be made of gold but, not being able to find it, they instead burned the church to the ground in 1824. The 2-level church has never been reconstructed and its coralstone and adobe walls were crumbling and creeping with vines until the 1960s, when a small chapel (literally “a church within a church”) was built within its massive walls. It was renovated in 2011. Masonic symbol of a square over compass? Above the main entrance arch, on the second level, is a small statue niche, above which is the Augustinian symbol of the pierced heart. Flanking it are rectangular openings. Pockets along the walls display several Christian icons. Outside the native-style church is a small plaza with 2 shrines (one for Jesus and the other for the Virgin Mary). 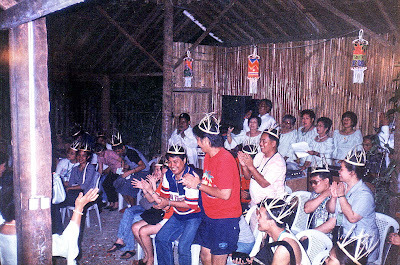 Simbahan Bato: Brgy. 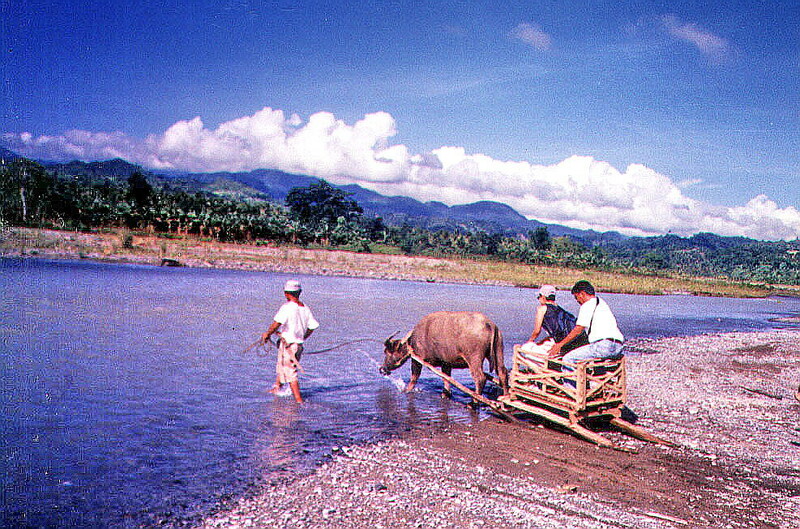 Bancuro, Naujan, Mindoro Oriental. It is a 45-min. jeepney ride from the town proper. The dreaded Day 3 soon dawned upon us, the long (210 kms.) haul, with Charlie again at the wheel, from San Jose down south the previously mentioned horrendous stretch, then up north to the Mindoro Oriental border and on to Calapan City, the provincial capitol and the island’s only city. We hoped to make it in time to meet with city officials. After a short, early morning visit to San Jose’s Caminawit Port and 6 kms. of concrete road out of the town, the road soon returned to gravel up to Magsaysay town. This was heaven to what awaited us: a “short” 35-km. uphill/downhill stretch along one of the worst “roads” I have ever seen, still tossing about, even in a car with good suspensions. We never encountered any car, only motorbikes and an occasional bus. The bad road condition was tempered by beautiful mountain scenery untouched by “progress” (brought about by good roads). Upon entering Bulalacao, the road soon hugged the coast opening, before us, a panoramic, offshore scenery of beautiful islands along Bulalacao Bay. Upon reaching a gas station, we had our dusty car washed, thinking that the road ahead would be better. How wrong we were! Although the worst was behind us, it was still gravel all the way to Mansalay and Roxas, again coating our newly-washed car with dust. 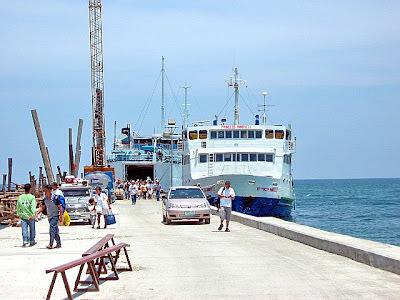 We arrived at Roxas town’s Danggay Port by noon, taking our lunch at a small eatery, part of the time watching people and cars unloading from a slow ferry at the RORO pier, the gateway to the white sand beaches of Boracay Island (a 5 to 6-hr. boat ride away), the country’s No. 1 tourist destination. The road from hereon to Calapan City was paved, partly concrete and mostly new and ancient asphalt (with occasional potholes). It was still a long, nearly 100-km. drive to the city but, from now on, it was all smooth sailing. Still, we were in a rush. However, old habits die hard and the tourist in us egged us to veer into a narrow dirt road, hoping to get a better view of the 79-sq. km. 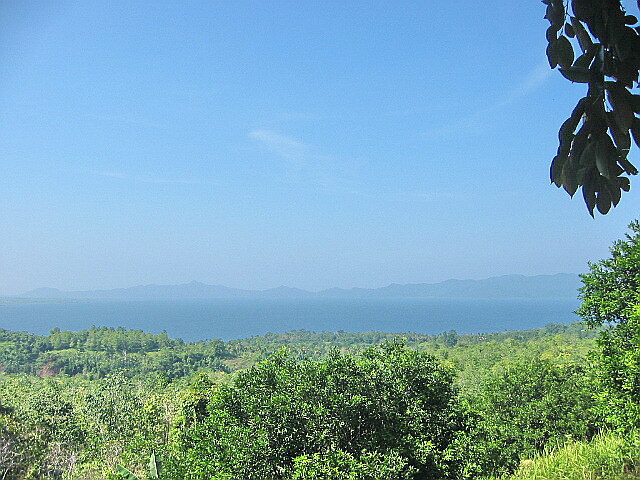 freshwater Lake Naujan, the largest (covering the towns of Naujan, Pola and Victoria) in the province and fifth largest in the country. Ideal for birdwatching (it supports a large number of ducks and other waterfowl), the lake’s rich fauna also includes the country’s two crocodile species: the highly endangered Mindoro freshwater crocodile (Crocodylus mindorensis) and the estuarine crocodile (Crocodylus porosus). However, no matter how far we went, no good vantage point was in sight so I decided to leave the car, go by foot up a hill and there, get a good shot. We finally reached Calapan City by 4 PM and got to meet with city officials at their stunningly new, white-painted and 2-storey high City Hall, built in the Neo-Classical style of architecture. Calapan has changed much since my last visit and the city is now booming, with new hotels sprouting up. One such, the Calapan Bay Hotel, where we stayed overnight, is worthy of note. Aside from its 12 beautiful airconditioned rooms with bath and cable TV (standard and superior), its appeal lies in its porch-like, multi-cuisine coffee shop (Café Angela) facing the sea. Here, one savors not only the good food but also the all-embracing whiff of the cool sea breeze. Too bad it was just an overnight stay. I would have enjoyed a longer stay. Just the same, we still had to proceed to Puerto Galera, our final destination and debarkation point back to Manila. We were all awake by 6:30 AM and soon picked up by our trusty driver Mr. Saez for breakfast at Byahero. Our guides soon arrived minus Karen who was replaced by Ms. Eleanor “Nhoy” Magsino. Laden with packed lunch and bottled water provided by Robert, we left by 8 AM, traveling the 14-km. distance to Brgy. Mirayan in 30 mins.. The starting point is beside a swift flowing river. 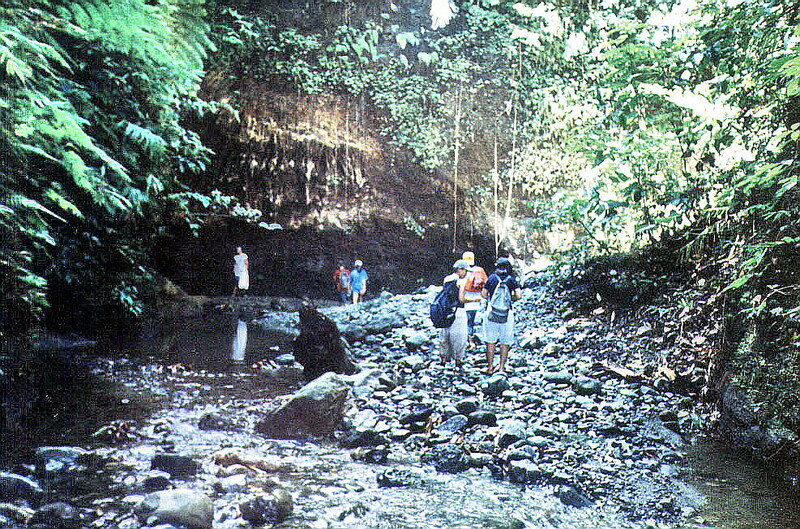 From hereon, it would be all footwork (and some swimming) through different types of terrain: rivers, mud tracks, steep hills, creeks and boulders. The short crossing over the fast-flowing river proved to be difficult, more so if it had rained the night before (no wonder we were not allowed to go during my first visit). Luckily, a carabao-driven cart was also crossing. 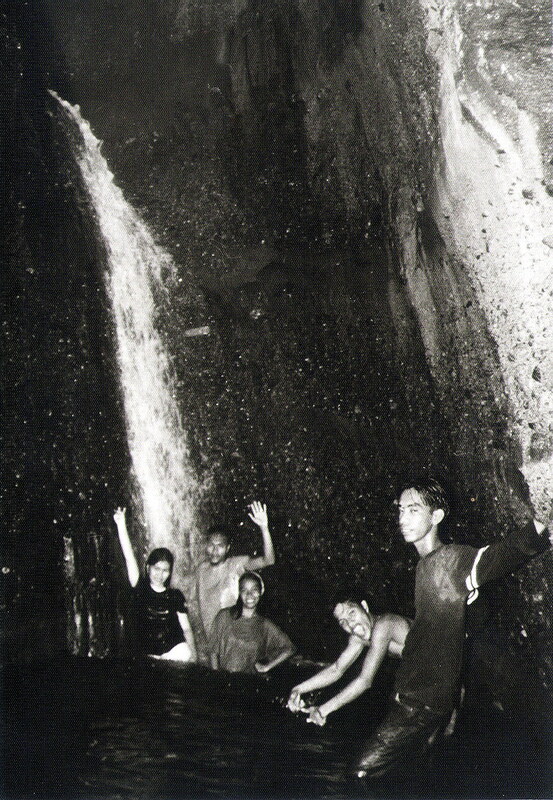 Rodel, who would have had a hard time crossing with his polio-stricken right leg, hopped in. Me and the others followed behind. Our next hurdle would be just as difficult (and longer), slogging through the muck of a dirt road muddied by previous rains. This road, built to provide easier access to the falls, had just being started and grading work was going on. 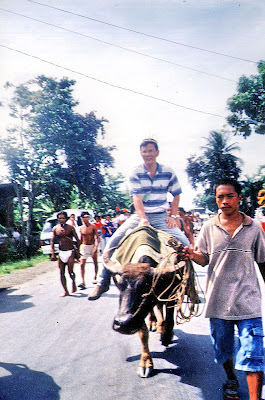 The carabao cart pushed on with its human load and so did we, merrily singing and chatting as we walked. An opening alongside the road signaled the start of our hilltop trek (and the end of Rodel’s carabao cart ride). 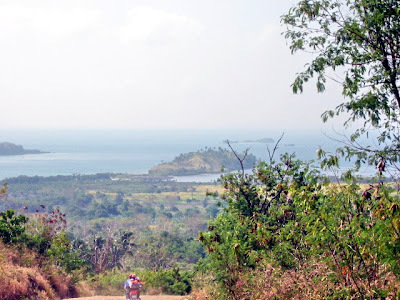 It wasn’t so steep but the muddy trail, plus the intense heat of the sun which penetrated the light forest, made it very tiring especially for the limping but still game Rodel. 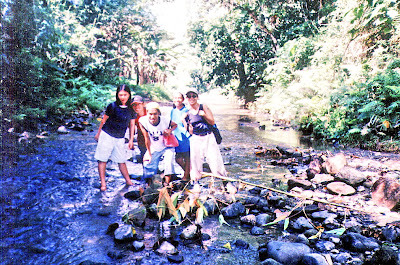 Once downhill, we were rewarded, at the foot, by the cool, clear and inviting waters of a smooth-flowing stream. I lay down by the shallow waters, feeling its cool comfort flow through the length of my body. I could have stayed that way the whole day but it was not to be as we were only halfway to our goal. Our sole consolation was that the remaining part of the trek would be all along this meandering stream. 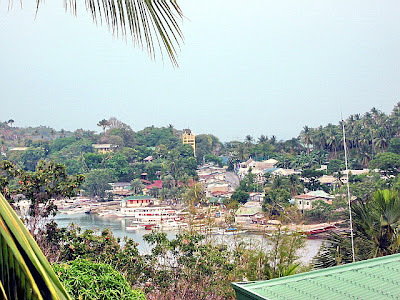 The initial portion was along evergreen banks lined with coconut and banana trees, giant ferns and some nipa houses. Occasionally, we would cut corners by making short, diagonal overland treks. Soon, we were in for a change of scenery. 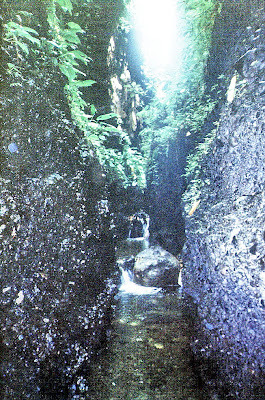 As we went further down the river, it started to narrow dramatically and began to change to eerie jungle, with massive and very rugged rocky outcrops gradually towering, high and steeply, on both sides of the river. We also passed some bizarre, weather-sculpted rock formations. Huge trees, with interlaced, hanging roots and thick branches, hug the river’s edge. Some, uprooted by typhoons, blocked our path. Large boulders also jutted out the water. I was also slowly being drenched by a drizzle from above. No, it wasn’t raining. 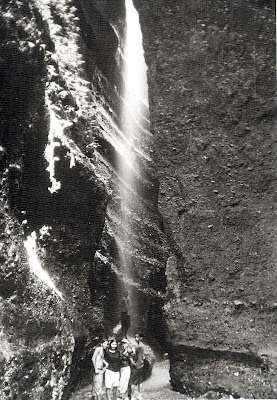 Rather, small waterfalls from underground streams in the cliff above were being blown by the wind to create a perpetual drizzle. I was so engrossed by my surroundings that I failed to notice that, with my huge stride, I had left behind my guides and now was all by my lonesome. It dawned upon me that I must have made a wrong turn. I was lost. But not for long. Soon enough, Exan and Donna came to my rescue. Rather than turn back, I decided to push forward and see what was at its end. The gorge was getting narrower, so much so that I could touch both sides of the gorge with my outstretched arms. The river was also getting deeper, waist-high, in my case, and neck-high for the diminutive Donna. 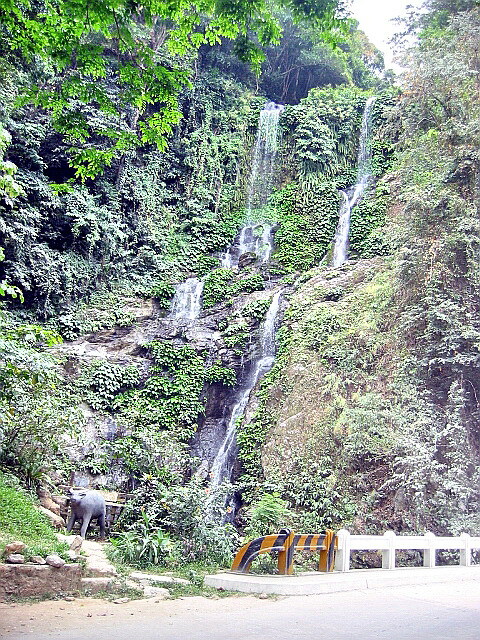 Our efforts were rewarded with vistas of two small but beautiful waterfalls: an unnamed one, at our right, and May Langit Falls at the end of the gorge. Thus fulfilled, we retraced our way back to rejoin our companions. The way to Walang Langit was via a fork on the river which I somehow missed. The path through was no less difficult than my previous trek. Luckily, a huge fallen tree trunk which once blocked the path had been sawn by the municipal government into six-inch sections similar to the tadtaran (chopping boards) of old. After passing another waterfall, I was dumbstruck by what I finally saw at the gorge’s end, the 100-ft. high torrent of Walang Langit Falls, surrounded, in all its majesty, by equally tall, densely-vegetated cliffs flanking it. Here, the sun only penetrates the gorge at noon. Simply awe-inspiring. Only in my dreams can I imagine such a place. 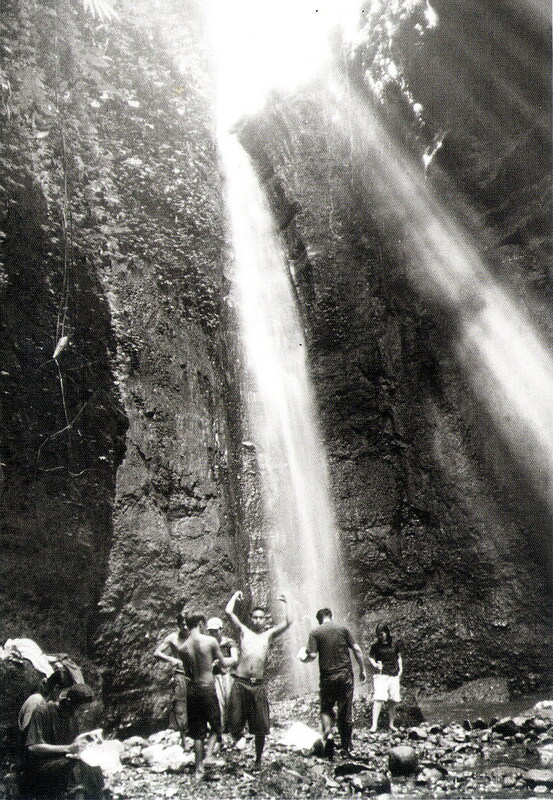 Much anticipated was a dip in its icy-cold, waist-deep pool. Once acclimatized with the cold, we also indulged in a tingling back massage underneath the fall. Soon all these activities made us hungry and we finally recharged ourselves with a much-needed lunch. Rodel and I soon finished our photo shoot with a prayer, hoping that our shots in the dim light would come out nice. 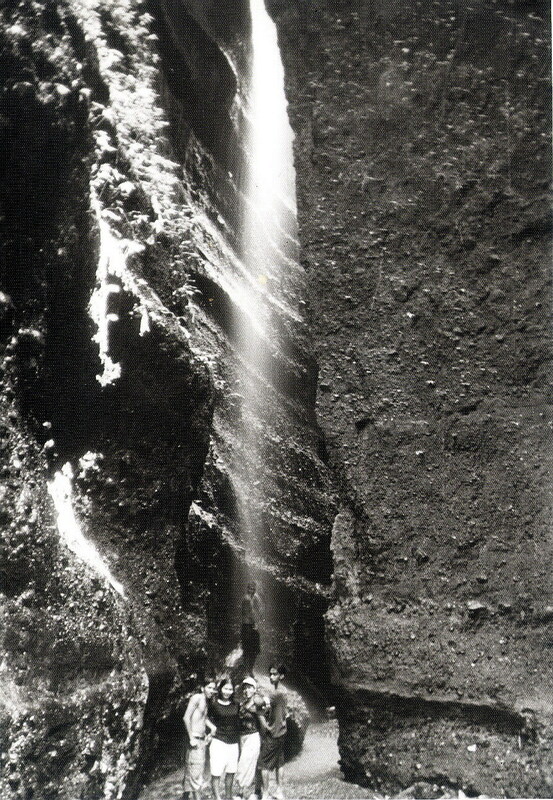 Rodel alone used up 3rolls of black and white film by the end of the day. It was getting late and we had another long hike ahead of us. Our gear was soon packed (including our garbage). However, I wasn’t looking forward to this return hike as we were now going to do it in reverse, from heaven back to earth. We were totally drained once we got back to the dirt road. The return hike took twice as long and we made it back to our vehicle very late in the afternoon. As we couldn’t make it to the last Supercat ferry trip back to Batangas City, we decided to stay another night in Gloria. Sleep was again out of the question as Robert honored us with a small despedida (farewell) party, with our guides, at our cottage. We left at 2:30 AM for Calapan City, making it to the first fast ferry (6 AM) back to Batangas City and on to Manila. I was back on “earth” by 9 AM. Goodbye heaven. On October 24, Thursday, I returned to the town of Gloria with 200 copies of TODAY with my Kawayanan Festival article ordered by Gloria Mayor Romeo D. Alvarez. Joining me was Rodel Rotoni, one of TODAY’s veteran photographers and a native of Bansud, Gloria’s next door neighbor. Rodel and I left Manila by 8 AM on an airconditioned BLTB bus for Batangas City. 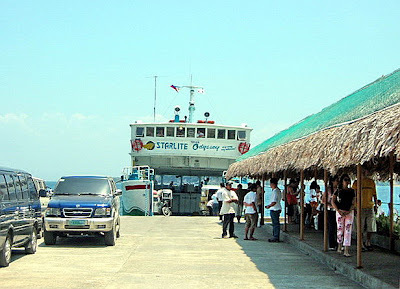 Upon arrival in Batangas City, we took the 11:30 AM Supercat fast ferry to Calapan City, arriving there in 45 mins. Upon arrival at Calapan Port, we were welcomed by my same Kawayanan Festival guide, Ms. Maria Goretti “Gorett” Mercado, the town’s newly designated municipal tourism secretary, as well as by guide Mr. Pablo S. Saguid and driver Mr. Oscar Saez. We traveled the whole 81-km. (1.5-hr.) distance to Gloria via a Toyota Tamaraw van. After a very late lunch at the Byahero Restaurant of Robert Villavicencio, Gloria’s Tourism Council head, we made a courtesy call and “newspaper delivery” to Mayor Alvarez at the municipal hall. Mayor invited us to explore the Walang Langit Falls in Brgy. Buong Lupa the next day. Rodel and I were billeted at the Prima Farm Resort in Brgy. Bulaklakan. Our bamboo cottage, aptly named Bulaklakan, had all the trappings of a luxury suite: airconditioning, large bed, cable TV, VCR and a large, elegant red tiled bathroom with bathtub. That evening, we got to meet our 7 guides to the falls. Aside from Gorett and Pablo, we also had Ms. Donalyn “Donna” Aquino, Ms. Karen Fabalinia, Mr. Exan Rofuli, Mr. Rodelio “Ode” Saguid and Mr. Paolo “Pao” San Jose; all of them veterans. Never in the annals of domestic tourism has so few been guided by so many (my pun of the late, great Sir Winston Churchill’s speech). That night was all fun, fun, fun. After soaking our tired, heavily traveled bodies at the icy-cold waters of Dupong Freshwater Resort’s spring-fed pool, we then sang our hearts out at the videoke. Later, we all joined Mayor Alvarez and Robert at the Brgy. Banus fiesta for a night of ballroom dancing and drinking. I politely passed on the first option and moderately indulged in the second. Rodel and I were back at our cottage by midnight as tomorrow promises to be a big day. Not much sleep though as Rodel snored through the night. Dupong Freshwater Resort: Sitio Dupong, Brgy. Kawit, Gloria Mindoro Oriental. Mobile number: (0916) 674-3968. Prima Farm Resort: Brgy. 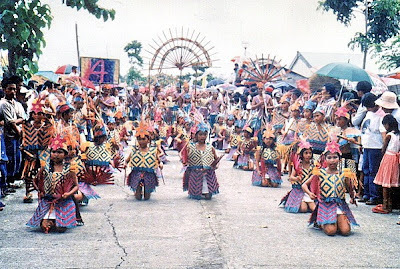 Bulaklakan, Gloria, Mindoro Oriental. 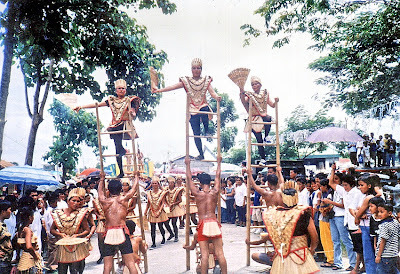 Throughout my 4-day stay in the town, I was kept busy by undertaking with gusto, the role of judge for four of the festivals’ competitions: the Bamboo Booth competition (maybe because of my being an architect), the Cookfest (my favorite pastime: eating that is, not cooking), the Street Dancing Competition and the In-Place Dance Competition (held at the gym). It seems that the only contest I didn’t judge was the Miss Gloria Tourism 2002 beauty contest. On my second day, to save on time, I did my bamboo booth and cookfest assignment at the same time. It was easier said than done. Midway through my assignment, my complexion turned from fair to really brown (like roasted lechon). However, the cookfest was a delight as I got to sample, mostly for the first time, the town’s labong cuisine, making it a point to sample each dish once in every booth. 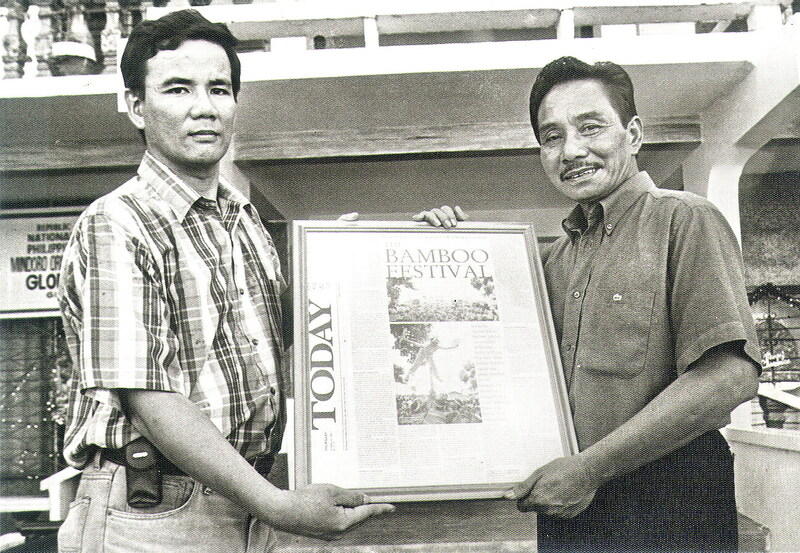 Of the present 22 bamboo varieties in town, only two (the first-class tinikan and bolo) are used for labong. In succession, I tried the atsarang labong (Brgy. 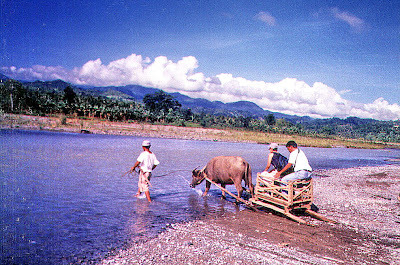 A. Bonifacio), embutidong labong (Brgy. 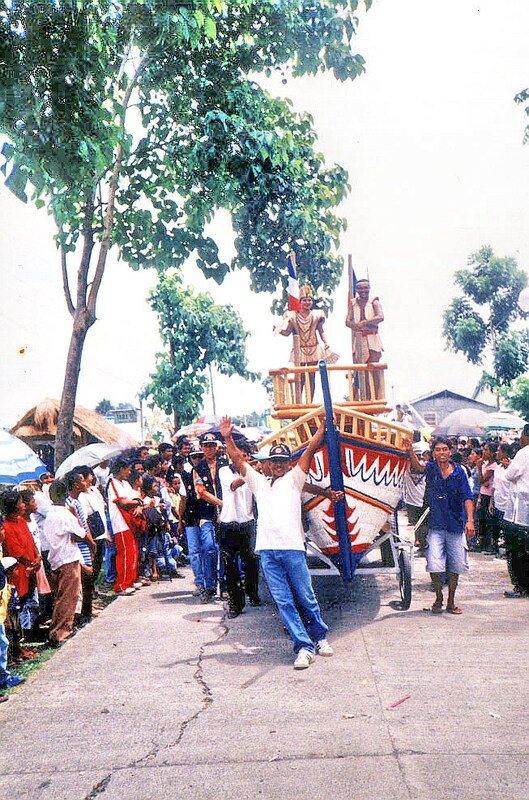 Kawit), apritadang manok with labong (Brgy. Mirayan), fried lumpiang labong (Brgy. San Antonio), fresh lumpiang labong (Barangay Lucio Laurel), tortilla con labong (Brgy. Agsalin), guinataang labong, labong salad and bola-bolang labong. I also enjoyed the buko pandan and cassava chips, washing it all down with buko juice. So much for lunch (and dinner). I don’t recall what I sampled in Brgy. Guimbonan but she handily won the cookfest’s grand prize. Brgy. Malayong won the booth competition. 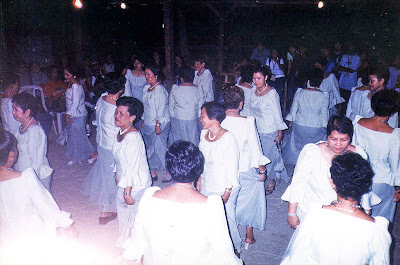 If the cookfest was a delight, the two dance competitions were spectacles by themselves. Costumes, musical instruments and props (including the bamboo galleon of Brgy. Lucio Laurel) used were all bamboo-inspired. What was truly spectacular was some of the choreography (to the beat of the latest dance music) which included some death defying stunts fit for a circus. 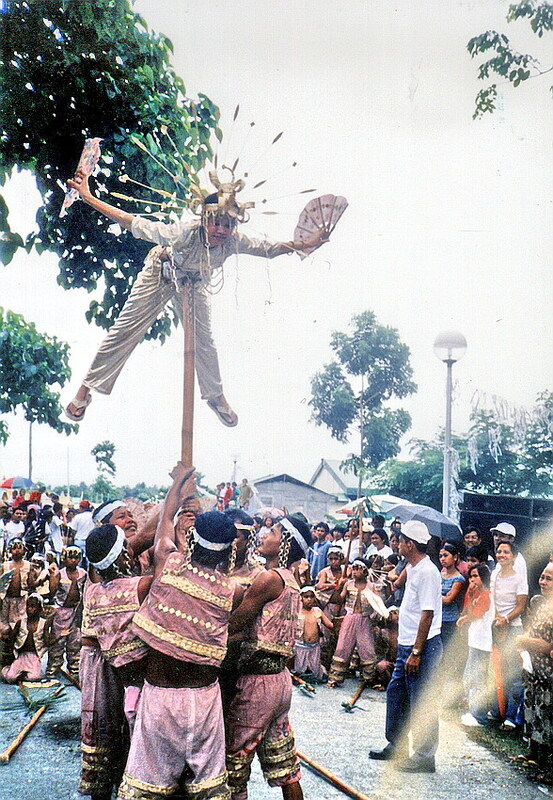 Try balancing spread eagle on the tip of a bamboo pole using the pit of your stomach or try dancing on the top rungs of 3 1-storey high bamboo ladders held vertically together. I wouldn’t dare but they did. In the end, Brgy. Tambong won the Street Dancing Competition (with Narra second) and Brgy. Lucio-Laurel the In-Place Dancing Competition (with Maligaya second). 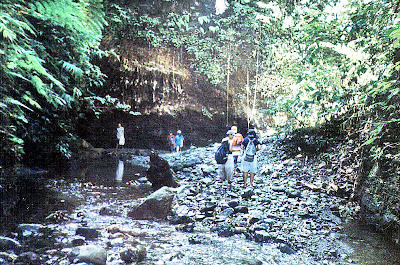 Gloria is a coastal town and beautiful black sand beaches facing the Tablas Strait extend from Barangays Tambong to Agsalin. Too bad there is no setting sun along this coast (Mindoro Oriental faces east). Just the same, the municipality is making efforts to develop resorts along this beautiful coast. Part of our itinerary was a visit to these resorts. They include El Primus Jose (Brgy. 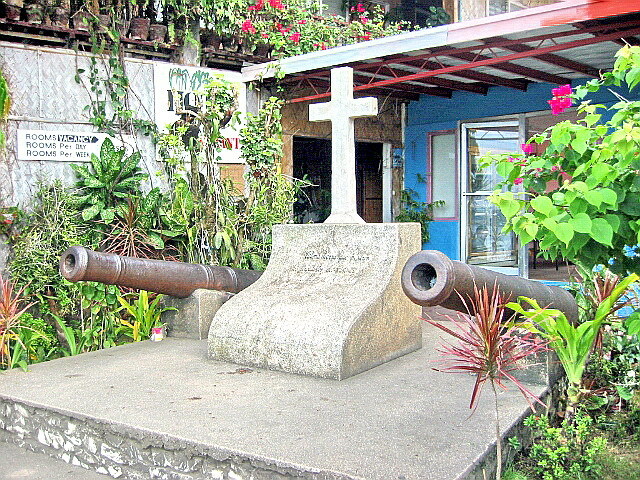 Tambong Punta), Villa Escober Beach Resort (Brgy. San Antonio) and Bighani Beach Resort and Mabuhay Beach Resort, both in Brgy. Giumbonan. On our last day, we had breakfast at the dining pavilion of Prima Farm Resort in Brgy. Bulaklakan. This rising star of a resort has so far finished 11 airconditioned cottages with bath and TV, all beautifully built with the town’s trademark bamboo in mind. 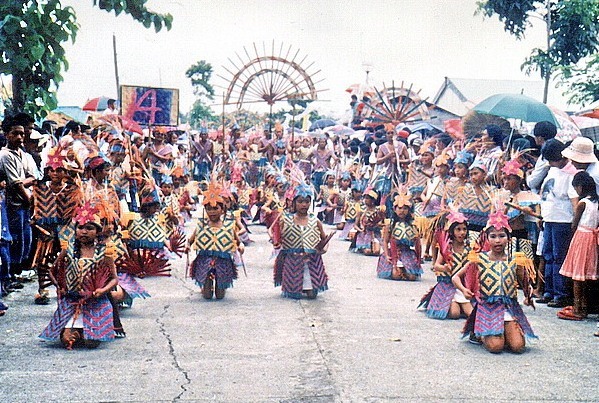 Each are also named after one of the town’s 27 barangays and built accordingly by the barangay’s artisans. The resort intends to finish, in the near future, its complete roster of 27 cottages.